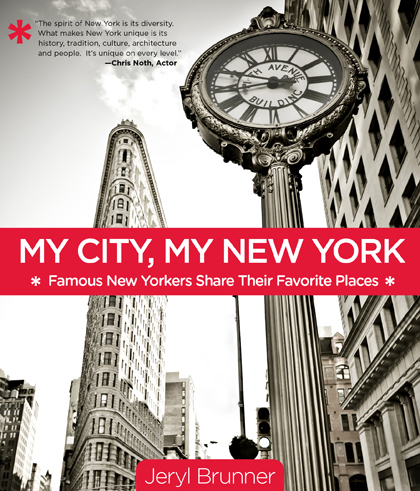 Jeryl Brunner | My City, My New York: Famous New Yorkers Share Their Favorite Places. THE QUESTION: WHAT DO YOU LOVE TO DO DURING YOUR FREE TIME IN LOS ANGELES? The Interviewees: NEARLY 300 NOTABLES: ACTORS, WRITERS, CHEFS, DIRECTORS, MUSICIANS AND MOGULS – FROM JESSICA CHASTAIN TO ROB LOWE TO VANESSA HUDGENS TO RYAN SEACREST TO DUSTIN HOFFMAN TO BONNIE RAITT TO MANDY PATINKIN TO SELENA GOMEZ TO LUCY LIU TO RYAN SEACREST TO ANJELICA HUSTON TO MAYOR ANTONIO R. VILLARAIGOSA AND MANY MORE! 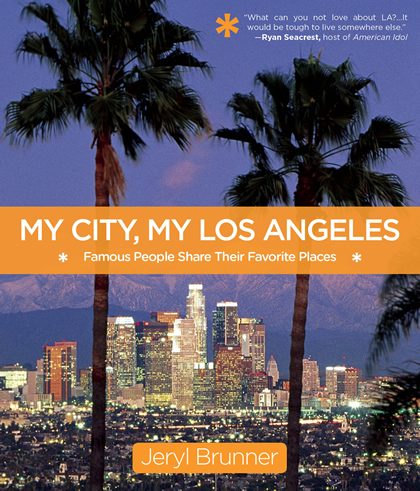 What do famous people love to do during their free time in Los Angeles? Angelenos and other notables have their rituals that connect them to the city in a unique way: favorite restaurants, museums, beaches, parks, markets, landmarks, haunts, and hideaways. The activities are as diverse and eclectic as the city itself. My City, My Los Angeles gives readers something truly unique—a chance to experience L.A. the way the city’s most notable luminaries do. Like a whispered secret My City, My Los Angeles shares tidbits of the town's magic from some of the people who know it so intimately. Let My City, My Los Angeles bring new and creative possibilities for exploration. THE QUESTION: WHAT DO YOU LOVE TO DO DURING YOUR FREE TIME IN New York City? The Interviewees: 300 of New York City’s notables: actors, writers, chefs, directors, sports stars and moguls – from Matthew Broderick to TINA FEY to Fran Lebowitz to Woody Allen to JOY BEHAR to Daniel Boulud to JULIANNA MARGULIES and many more! Most New Yorkers, even famous ones, have cherished rituals and favorite places that connect them to their city in unique ways. They have their beloved restaurants, museums, parks, galleries, landmarks, haunts, and hideaways. It may be watching tango dancers on Saturday nights in Central Park. Or riding a bike over the Brooklyn Bridge for a slice of Grimaldi’s pepperoni pizza and a view of the Manhattan skyline from across the East River. Perhaps it entails choosing from the many varieties of bread at Rock Hill Bake House in the Union Square Greenmarket or simply walking across 46th Street and ending up at Joe Allen, the great Broadway hangout. The activities are as diverse and eclectic as the city itself. Just thinking about them is pure bliss - like visiting an old friend or reading a favorite line from a cherished book. So imagine a book in which Matthew Broderick shares his favorite bike ride. Nora Ephron describes where she buys discounted roses in every imaginable color. Edward Norton reveals his favorite restaurant. Daniel Bould talks about his favorite pizza joint and where he buys cheese. My City, My New York lets you experience the city as some of your favorite New Yorkers do and get a peek into parts of the town that they hold dear. What’s more, it’s also a love letter to the Big Apple. As F. Scott Fitzgerald once said about New York, “I carry the place around the world in my heart, but sometimes I try to shake it off in my dreams.” New York City holds a myriad of great experiences, the possibility of an infinite adventure, a personal journey. Like a whispered secret My City, My New York shares tidbits of the town's magic from some of the people who know it so intimately. Let My City, My New York bring new and creative possibilities for exploration. And hopefully it will inspire you to discover all the ways you can carry the place around in your heart too.